Girgensons goal was a strong effort that saw him take a shot on goal then drive hard with a follow-up that banked in off of former Sabres goalie Ryan Miller. It was Girgensons' seventh goal of the season and the Sabres sixth shortie of the season, tying them for third in the league. However, the Ducks Rikard Rakell would tie the game early in the second period as his five-hole backhand was initially stopped, but trickled through a sliding Robin Lehner whose right pad pushed it in the net. The teams traded goals and left the second period tied 2-2. Then midway through the third period, Lehner scored on a tip off a shot from Ryan O'Reilly. Unfortunately for Buffalo, it was in their own net. With a scramble going on just outside the crease in front of Lehner and the Ducks packed in tight, O'Reilly tried to do what he's done hundreds of times throughout his career, get out of trouble by dumping the puck behind the net. The initial reaction was that his dump went top-shelf behind Lehner. Upon replay, O'Reilly's clearing rode up Lehner's stick and into their own goal. Yet, redemption was on the horizon as O'Reilly scored the game-tying goal with Lehner pulled and only 14.5 seconds to play sending what was left of the crowd in a frenzy. The stage was set in overtime for a dramatic win. At 1:15 into overtime, Sabres d-man Rasmus Ristolainen had the puck in his own zone and had his eyes on a streaking Jack Eichel headed up-ice with tons of open space. But he missed him by 10 feet and the Ducks gained possession. Less than a minute later Henrique whistled a wrister by Lehner from just inside the Sabres blueline. Such was the night for Buffalo. And such is overtime. It's amazing that a team with the likes of Eichel and O'Reilly, Ristolainen and Evander Kane are now 3-9 in overtime. Similarly, it was hard to believe that a team that finished first-overall on the powerplay last year would sink to 30th for the majority of this season. The Sabres powerplay was abhorrent early in the season and may have cost them some valuable points along the way. As of late they've gotten their act together as evidenced by a beautiful play last night with the man advantage. O'Reilly won the draw and the other four Sabres all touched the puck with Sam Reinhart making a tip pass to a wide open Eichel who scored his 21st of the season. Last year Eichel scored 10 of his 24 goals on the powerplay this year he has only three. 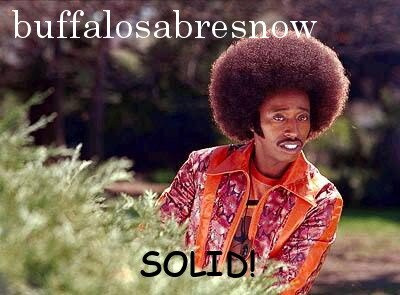 The Sabres corrected that as of late. Prior to a road date in Edmonton last month, the Sabres were ranked 30th converting on a paltry 20 of 123 chances (14.0%.) They've scored on seven of 20 opportunities since (35%) and are 26th in the league at 16.6%. Granted, Buffalo is only 2-3-1 since beating Edmonton, but at least it's one aspect of the game that they've improved considerably upon. 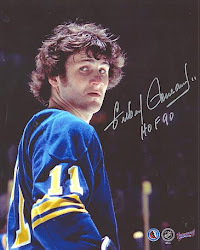 In addition to the nine games Buffalo has lost in overtime this season, the Sabres have lost one in the shootout, another eight games by one goal and on nine occasions Buffalo was down by one goal in the third period with the goalie pulled, but allowed at least one empty net goal. In essence the Sabres were in 27 one-goal games when you add in the games they gave up an empty-netter. They're 14-29-10 on the season with 38 points. Ristolainen is the goat of the game last night despite the fact that nearly a minute transpired between his missed pass and Anaheim's goal. No doubt Henrique's shot was quick, hard and accurate, and yes the three Sabres surrounding him--Eichel, Reinhart and Ristolainen--could have taken away more space, but that's a shot from far out that normally is stopped and Lehner should have had that one. Puck possession is key in overtime, but puck retrieval, when the opportunity arises, is even more important. In the :51 between Ristolainen's egregious overshoot of Eichel and Henrique's goal, the Sabres had two opportunities to get the puck back and both involved Reinhart. The first one he lost a battle with Ryan Kessler who fanned on a shot in the circle to the right of Lehner and on the second one he was outsmarted by Jakob Silfverberg along the wall in the Buffalo zone. Ristolainen's missed pass/turnover was pretty bad, but if you want to bail out your teammate, sometimes ya gotta work a little harder. Defenseman Casey Nelson continues to impress. He has all the tools--skating, stickwork, hockey sense and puck-moving ability--that Housley wants out of his defensemen. In nine games this year Nelson has an assist and is a minus-3 but doesn't look out of place at all. With Zach Bogosian out and Jake McCabe's status uncertain after going down to injury last night, Nelson should be up for an extended look which is good for him and good for the team.